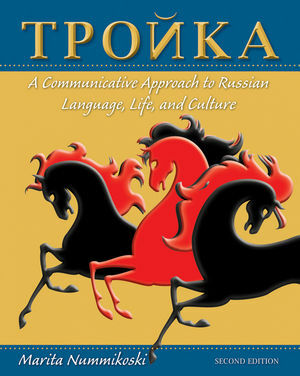 This communicative "natural approach" to introductory Russian emphasizes reading, writing, speaking, and listening skills. Everyday topics are presented to allow readers to begin communicating immediately. Grammar is presented as a necessary tool for communication and is introduced throughout. The book aims at comparing and contrasting cultures, rather than presenting the target culture only. Associate professor and coordinator of UTSA's Russian program, Dr. Nummikoski was named interim chair of the language?department at the University of Texas,?San Antonio?beginning with the Spring Semester 2002 and chair the following fall. A member of the UTSA faculty since 1988, she is author of Troika: A Communicative Approach to Russian Language, Life, and Culture, a Russian textbook first published by John Wiley and Sons, New York, in 1996. Since that time, Dr. Nummikoski has added an interactive website to support the text and is working on a second-year Russian textbook with the working title of Sputnik. She received three degrees from Helsinki University in Finland and earned her Ph.D. in foreign language education (Russian) at the University of Texas at Austin in 1991. Lesson 1. What is your name? Lesson 2. Do you speak Russian? Lesson 3. What do you have? Lesson 4. Where is the post-office? Lesson 5. Where do you live? Lesson 6. Do you work or study? Lesson 7. What do you do every day? Lesson 8. Do you like classical music? Lesson 9. What do you like to do in your free time? Lesson 10. Where do you study? Lesson 11. Where can I buy caviar? Lesson 12. What shall we do on Saturday? Lesson 13. What should I buy her? Lesson 14. What's the weather like tomorrow? Lesson 15. Where are you going in the summer? Lesson 16. Where are we going to eat? Lesson 17. What are your plans for the future? Lesson 18. How are you feeling? · New exercises have been added, and the sequence of the material within the chapters has been slightly adjusted. · A brand new media package for this edition includes two separate video programs and an expanded audio program, vocabulary flashcards with audio, PowerPoint presentations, self-tests, online grammar exercises, and an enhanced Instructor’s Resource Kit. · Updated culture notes and opening photos reflect changes in Russia today. · Several thematically appropriate verbs have been added to the beginning lessons, and grammatical topics are now introduced earlier, but with their main treatment remaining in the original chapter. · A new section on the use of cases was added to the Grammar Reference, and the case ending charts on the back endpapers are now given in the standard Russian order. · The Student Activities Manual offers revised exercises and a new section called Áëîã Àííû Ñòåïàíèíîé. · The syllabus of Troika is based on topics and communicative situations that gradually increase in complexity. The topics are sequenced according to a feasible order of grammar presentation. · Grammar is taught as a necessary tool for communication, not as a goal in itself. The chapters cover all points of grammar relevant to the topics, but avoid presenting grammar that cannot be substantiated by the topics. Still, Troika contains all the grammatical structures typically introduced in an elementary Russian textbook. · The textbook is student oriented, and the topics introduce material that students can easily relate to. The leading idea of Troika is that, from the very beginning, students need to be able to talk about something real, instead of simply memorizing dialogues. · Culture is both intertwined in the material itself and presented in separate cultural notes. Troika aims at comparing and contrasting cultures, rather than presenting the target culture only. Information is given about famous people, facts, geography, traditions, and history of the country, and students are asked to give the corresponding information about their own country. · Readings are placed within the topics, rather than in separate sections. · Illustrations in Troika are humorous and cater to the needs of visual learners. · Highlighted information boxes stand out from the rest of the text and serve as conversation guidelines for students.